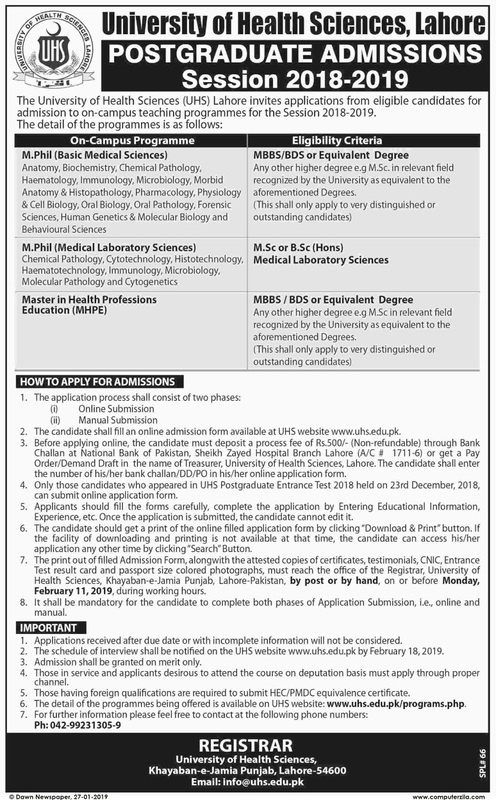 Admissions Open at UNIVERSITY OF HEALTH SCIENCES LAHORE's Main Cumpus for the batch Spring 2019. UHS offers admissions in different fields of study for Master Programs. University DescriptionUHS campus was inaugurated by the President of Pakistan - who is also its patron - on October 02, 2002. Its building has a commanding domed elevation and it houses spacious class rooms, high-tech labs, dining halls, staff offices, senate hall, library and 500-seater Shams Auditorium, which collectively create a perfect academic ambience. UHS shall be innovative global centre of excellence in learning and research, supporting a community of scholars and professionals committed to serving society, promoting the development of students to reach their true potential in becoming competent, ethical, caring and inquiring health professionals for the benefit of the country and the wider world.